PLEASE READ BEFORE BOOKING YOUR RESERVATION: Due to the popularity of the tour we recommend booking at least two weeks in advance, its very rare that we will be able to do same day or next day bookings on short notice. Please provide a valid phone number and email address when booking your tour. Times subject to change based on weather and traffic conditions, it is the customers responsibility to check email and messages if changes do occur. 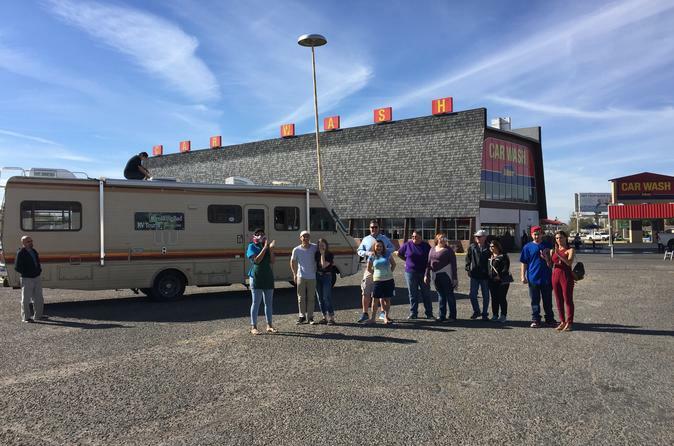 The Breaking Bad Tour includes your favorite locations such as : Jesse's House, Chucks, The Dog House, Peekaboo house, Tucco's, Badgers corner, Combo's Corner, The Railyard, Jessie's RV Junkyard, Walt's Mechanic,Jesse's Porta Potty, Los Pollos Hermano's, El Mechicano, The Grove, Crossroads Motel, Jane's apartment, Danny's, The Car Wash, Walt's House, Sauls office, The Super Lab and more. Locations are subject to change daily and are not guaranteed based on filming schedule. You can get out and take pictures at some locations. Tour includes a light meal and drink at Los Pollo's Hermano's, if unavailable breakfast or lunch will be at a alternate locations such as Blakes Lotaburger or the Central grill. Tour Guides are Actors who actually worked on the show. Win prizes, we will test your knowledge for both shows with gifts and prizes from local Merchants including Breaking Bad Rock Candy. Price includes lunch at Los Pollos Hermanos. Locations can change depending on filiming schedule and day. We do not drive by locations filming for Better Call Saul.